User Tracker Count: 165 times. The Chaos is a spinning wheel. 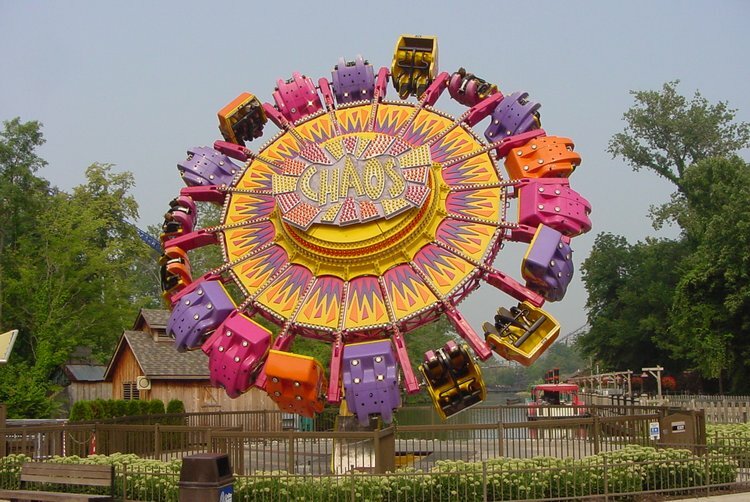 It is fun, fast, rerideable, it has a large capacity, a long duration, and it spins forwards and backwards alot. I think it is controlled mechanically. The only reason I rode this is because my family was going to maXair and my sister saw this ride. She really wanted to ride it, so I was the one forced to ride it with her. I was actually pleasantly surprised. There were some decent forces, and the free spinning design of the cars provided some exciting elements. Some times my car even turned all the way over and got me completely inverted. In any other park, I would say that this is a must ride, but since it's located at Cedar Point, there's a lot of bigger and better rides. If you have time, it's worth a ride. Very weak chaos. This one had a very short cycle and loading took a very long time. My ride consisted of only two flips at best and that was it. Unlike my rides on Chaoss at other parks, my ride on the Cedar Park version did not disappoint. It was similar in fun to the "Zipper" on which it is loosely based. Awesome, awesome. The Zipper is still better than this, but this is still awesome. I thought this would be a fun ride, from what I was told. Boy, were they wrong. This ride was so boring. I never even did a full flip. I turned half way upside down forward, but that was it. The rest of the time, I was just going back and forth. Overall, the ride was a huge disappointment. what a disappointment. All I hear is people raving about this ride, so I finally rode it. Well it looks like I picked the wrong park as the cycle was very short and the loading and unloading was real slow. I have heard kids at other parks talk about flipping their car over 10 times, I had the technique right but could only do it twice. And my brother-in-law was watching and said no other car flipped more than twice. Didnt figure out how to manually tip the car until the end of the ride, but I thought it was a lot of fun, and Id re-ride it without hesitation. This is one of Cedar Points best flat rides in my opinion. The freely spining cars give it a wild and out of control sensation.